Posts: 1 The hatch often occurs during high water (just after peak) so you sometimes have limited visibility during the hatch. Also - I believe that they can occur above 7000 feet. Posts: 2871 Another slant, but does higher water have any effect on mayfly and caddis hatches? Posts: 14 I usually fish 2 or 3 months a year out West and have been lucky enough to fish salmonfly hatches several times. I say lucky because you could go to a specific location or stream and miss the hatch even though you tried to time it perfectly. As mentioned by Troutnut, they do move upstream depending on the grade of the slope or decent of the stream. The hatch can last a while on larger rivers but not in any one area. The hatch time depends on the basic elevation of the stream. The hatch occurs in lower elevation streams earlier and higher elevation stream such as in the high Rocky Mountains later in the year. In the West Yellowstone area, the Madison will start in the canyon below Ennis and move upstream to below Hebgen usually in the last of June to the first couple of weeks in July. Runoff has usually already happened. As with most other hatches, this would occur later than it does in Oregon and Washington. It is a very confusing hatch for many. When anglers first start seeing the huge flies, they tend to tie on a dry imitation without any luck. Nymph fishing is the key since all stoneflies crawl to the banks and boulders to hatch. You can actually see them early in the mornings along the banks in the water and where they are crawling out of the water or the shucks where they have hatched. Soon after the hatch starts you will begin to see them in the air,bushes, rocks, etc and even on your body. For the first few days after the hatch (two or three) you can beat your brains out casting a dry without any action. When they start the egg laying process, things change 100% and this last a few days (two or three) and fishing can be great. I am describing an area of a river, not the entire river because this entire process is moving up stream as much as 3 to 5 miles a day depending on the stream. The fish can actually become gorged. I may not have spelling gorged right so full may be a better word. You will notice this is you start seeing them just knock the dry fly around without eating it. In many places, before the hatch ends, it can become compounded with Golden Stoneflies that also start to hatch. This greatly depends on the stream but I have seen it many times. If you get out to West Yellowstone the first week of July, you will most likely find them somewhere on the Madison somewhere between Quake Lake and Ennis. You have to adjust to the stage of the hatch by fishing a nymph or dry and move around a lot. The drift boat helps because you can cover a lot of water. If you wade or fish the banks, try several areas. There are 4 fly shops in town. Any of them will tell you where the stonefly hatch is happening. I have a new DVD coming out this month that has about 25 minutes of it devoted to the salmonfly hatch. It includes segments on stoneflies from all nine families and was shot from coast to coast. I hope all of you experience it one day. Our Eastern Giants hatch and deposit their eggs at night for the most part. I have never found them to hatch in large quanities approaching the salmonflies. I could go on forever but I suppose the strange thing about it is that the insects are so plentiful and so large, that in a prime habitat, they can fill the trout to the point they are difficult to catch. But don't panic, like many anglers, just move upstream (or downstream if the flies have hatch but not yet deposited their eggs). 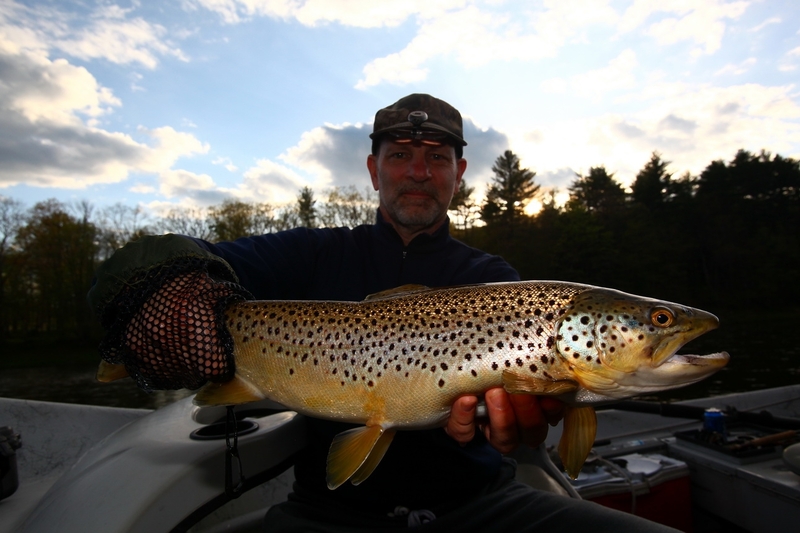 It is possible to catch several large trout in a few hours while they in the process of hatching or depositing their eggs. In the right spot at the right time, it can very exciting. Hope this helps those who haven't been there and done it. Posts: 14 My wife just happened to nose in and read my previous post. She beat me over the head with a magazine. I type as I think and never edit anything but I think I may have set a record for errors. No, I can't spell but I can do better than that. Hope you can make it out. Please excuse me. I also wanted to say that I have found the salmonflies many other places other than the Madison. One great place where the hatch usually occurs much earlier is the lower Henry Fork below the dam at Aston. This is a sleeper area anyway. The box canyon upstream above the Ranch usually has a lot of them. There are also hatches inside the Yellowstone Park. The Gallatin canyon is a good place. This usually happens in June. Late June and early July in the Gardner you will find them, usually along with the goldens. There are other hatches in the park. Of course, there are many other good streams with salmonfly hatches all over the West I just wanted to provide some specific locations you can count on. She beat me over the head with a magazine. Beachvid, your wife sounds a lot like mine. Except she usually gives me the "bad puppy" smack for just being a general dope, not so much for my spelling. :) And thanks for the great summary of the Western stonefly activity. does higher water have any effect on mayfly and caddisfly hatches? Short of flooding, Louis, I haven't noticed any significant effects. Though the unusually cold temperatures will slow things down. Posts: 7 I have guided the Gunnison Gorge for the last few years. It has the most prolific pteronarcys hatch that I have ever seen, they are crawling up your pants, in your hair, I randomly find them in my house they love to hitch hike. Two years ago the emergence happened on June 7th (low water 500 cfs), last year we had fairly high water (900 cfs) and the emergence happened on June 10th. Keep in mind that this is a tail water fishery not seriously affected by runoff. I don't know what will happen this year but I am expecting a hatch of fisherman larger than that of the pteronarcys due to the movie "The Hatch". I do not think the movie did anything good for the particular fishery but I don't hate these guys for making it. It is one of the best fishing videos I have ever seen. I could not sleep that night, all I wanted to do was fish! If you haven't seen it it is worth the 20 bucks, CHECK IT OUT! All hatches are later at higher altitudes it seems like but I believe the explanation for that is water temperature and dew point. Every time I hit the emergence of any stonefly hatch there is a high dew point the night of. Coincedense? I havent proven my self wrong yet. One trick to the stonefly hatch on high pressure rivers is to tie a size 16 curved hook "Leg Egg". Spin black rubber legs around the shank like you would with deer hair then trim them in the shape of an egg sack. Trail this hook 6 inches behind the female pteronarcys pattern when they start laying eggs. Fish do eat the egg sack. My Theory: the egg sack has more nutrition for the fish than the actual stonefly does. You will hook fish for one of 3 reasons using this technique. 2. they will come up and nip the actual stone due to being "stung" a few times, when they nip the dry you will hook them with the egg sack. 3. The guide knows your skill level and figures you need all the help you can get. This is our little secret! I have only told a few people this so keep it to yourself but try it out. Posts: 1 I consistantly catch fish with giant stone nymph patters well about 10000ft. A lot of female Pteronarcys, most of them, lay their eggs while above the water yet patterns are tied with a black egg sac dubbed at abdomen end. And for the Henry's Fork comment. They move up the NF very quickly, and into the Box Canyon far above,(late May) BUT, there is a later hatch down river I'd say 5 miles below the Ashton Dam at the Fun Farm above St. Anthony due to the colder water coming in from the Fall River at Chester Backwater, and the hatch occurs along that bank only...as much as a 2-3 weeks later. Posts: 1 They most definitely occur above 7000'. 6/5/17 I took a day to explore the cobbles near the river bank during high run off to see what was in stock for the trout. I live just shy of 9000', and to my surprise after reading Schwiebert, who said they often do not hatch above 7000', I found quite a few salmon flies in my local water.